By God’s grace, I was raised in a Christian home. There were times when I was delighted to go and others when my parents drug me but like other good Christian boys and girls I was at church every time the doors were open. Both my parents served in the church – Dad as a deacon and teacher, mom as a choir member and teacher, which left in me a lasting impression of a life that needs to be lived serving others. When I was six I remember listening to the pastor’s sermon for the very first time – and not really the entire sermon, but most likely the invitation. Bro Jack Mills, the pastor, asked, “if you were to die tonight in the ride home, how sure are you that you would go to heaven?” Later, my Dad tells me that I got in the car and asked him to drive slow. When I got home that night my parents asked what was wrong. I responded that I knew that they were going to heaven when they die but I wasn’t sure about myself. That night they shared the gospel with me but I went to bed a little unsure. The next day my mom took me to see Brother Jack. Jack explained essentially that my sin separated me from God, that Jesus died on the cross for my sin and that if I confessed in Jesus as Lord and believe that God raised him from the dead that I would be saved. It’s hard to believe, but I remember kneeling with the pastor and praying to receive Jesus Christ as savior and Lord. A short time later I was baptized by Jack at my home church, Harwood Terrace Baptist in Bedford, Texas. The only thing I remember about the baptism was the chill of the water. Starting in junior high – around 7th grade or so – I felt called into the ministry. But I was never too impressed with the size of the pastor’s house or quality of his car, so I spent many years ignoring that calling. Finally after my junior year of High School, I surrendered to the call of ministry. Around the middle of my junior year I started dating a sweet and godly young woman named Janet. Upon her graduation from High School, Janet attended Texas A&M University, where she earned her bachelors in early childhood development. After my own graduation, I followed Janet to Texas A&M and earned a B.A. in History with a minor in Business. We married in July of 2001, the summer after Janet graduated from A&M. We stayed in College Station for another year while I finished college. After A&M we moved back to the DFW area where I attended Southwestern Baptist Theological Seminary (SWBTS) and Janet taught kindergarten in Birdville ISD schools. During this same period I served as the youth pastor at my home church, Harwood Terrace. In May 2005, I graduated from SWBTS with a MDiv and in September of 2005 I started to serve at North Richland Hills Baptist Church (NRHBC). At NRHBC I started as the Missions and Evangelism pastor. In the summer of 2006 the responsibilities for the Young and Median adult Couples ministry were added and later in the fall of 2009 the Discipleship ministry became a part of my ministry responsibilities. After several years of infertility, Janet and I decided to adopt and in December of 2008, God blessed us through the adoption of our first child, Parker. 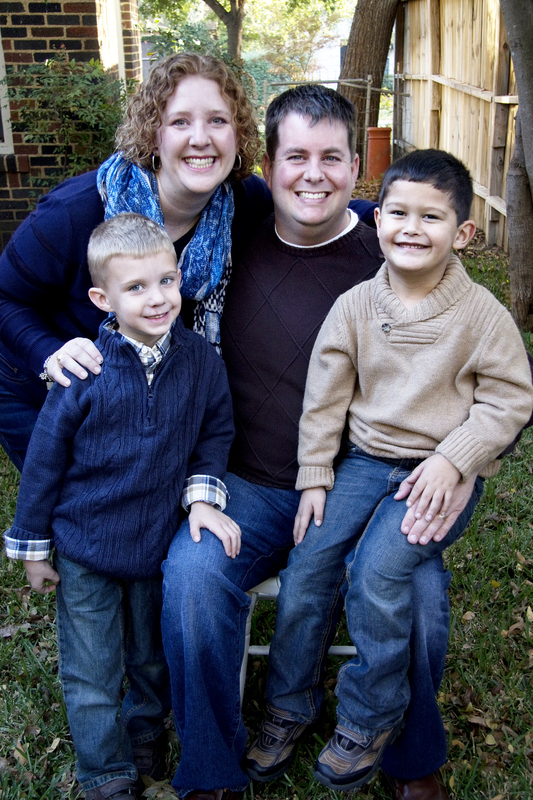 God further and surprisingly blessed us through the birth of their second son, Jonathan, on September 1, 2009. In other words, we have 2 kids who are 8 months apart. We are currently waiting on the adoption of a third child. At the beginning of 2009 I started work on a Doctor of Ministry at Fuller Theological Seminary. Working on a DMin at Fuller has been an incredible experience with week-long seminars with world-renowned professors such as Reggie McNeal, Alan Hirsch and William Willimon. I graduated in June of 2014 with a final project that focused on disciple-making through life coaching. I have repeatedly been blessed by God based solely on his grace and for that I praise Jesus Christ as Lord and Savior. SALVATION EXPERIENCE: At seven years old, my pastor posed this question at Vacation Bible School, “If you were to die tonight, would you go to Heaven or Hell.” I knew that my parents believed in Christ and would go to heaven when they died, but I was not sure about myself. After talking to my parents about salvation, they took me to the pastor the next day. Through the conversation with the pastor, I understood that I was a sinner and the consequences of sin are death and eternal separation from God. I also understood that God loved us so much he sent his son, Jesus, to die on the cross to pay the penalty of sin. I then believed in Christ and confessed him as my Lord and savior. A few weeks later I made my profession public by following Christ in baptism. CALL TO THE MINISTRY: At a young age, I perceived God calling me into the gospel ministry, but for several years I resisted this calling. At the age of seventeen, at youth camp, the Spirit’s calling became overwhelming, and I finally surrendered to the ministry. I have enjoyed my time as a youth pastor and an associate pastor, but ultimately, my calling is to be a senior pastor. In February of 2004, I was ordained to the gospel ministry. This calling has been affirmed several times since that day and I feel fully confident in my call to pastor. PHILOSOPHY OF MINISTRY: I do not believe the church is a building, instead it is a body of believers commissioned by Jesus Christ and empowered by the Holy Spirit to change a lost and dying world. As a pastor, my responsibility is to encourage and equip the body to that end through fresh and relevant preaching as well as bold and strategic leadership. The church body must move beyond the walls of the building to embody a life transformed by the gospel. Furthermore, the church body must fellowship with and minister to one another as well as the church is responsible to take the gospel to the end of the earth. VISION FOR THE CHURCH: The church must engage and intentionally equip each believer, of all ages, to obey the Great Commandments and the Great Commission. In other words, everything from the teaching, to the preaching, to the programs, and ministries of the church must help each church member to love God, to love others, and to tell others about Christ. The best place for this to occur is not in the church building but in the every day life of the church. The church must equip parents to teach their kids the faith; it must help singles serve others; the church must equip students to make their faith their own, and so on. It is no longer enough for disciple-making to occur on Sundays and Wednesday nights. Instead, the church must begin helping each believer to pursue their faith and to encourage faith in others with great intentionality.